It's time again for my 'Blog of the Week' feature. Each week, I'm looking at a different Filofax blog in the words of the owner. Some you may know already, whilst others may be new to you. This week, Iris talks about Filomaniac. There was no German blog for Filofax lovers. This one, a guest article by Steve Morton (surprise, surprise) about creating templates. None in particular. I'm proud to say that after two years, my blog is still going strong and I have "met" lots of interesting people who share my passion for Filofax. How many people in Germany still use (and love) their Filofax. 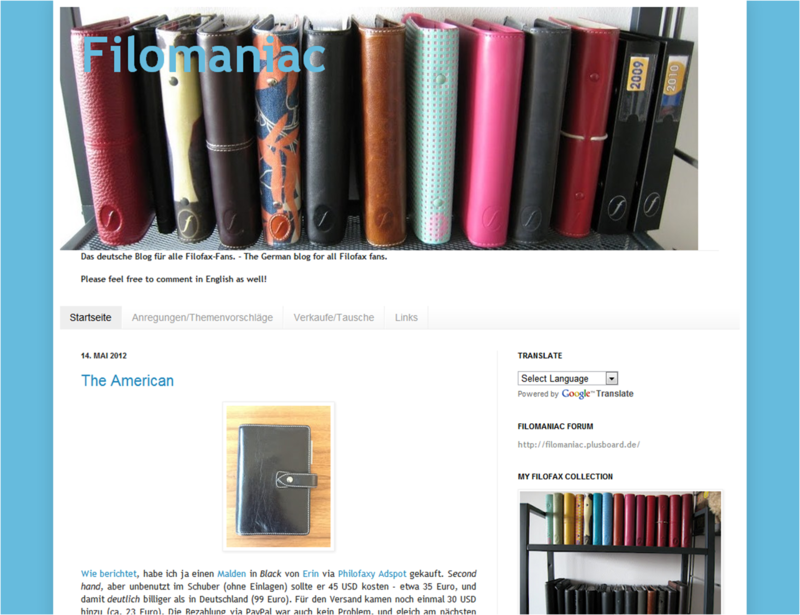 It's a German blog about all things Filofax. Read/respond to comments so people know that you care. Try to interact with your readers by asking them about their experience/opinion or by posting polls. Include some pics to make your posts more interesting. My thanks to Iris for participating. Made me chuckle to see my guest post is so popular! It's the same on Philofaxy with my Filofax Templates post from a couple of years ago getting hundreds of visits a week!